The Augusta Museum of History presents the 7th annual Night at the Museum, a fundraiser that supports the Museum's preservation and exhibition efforts. 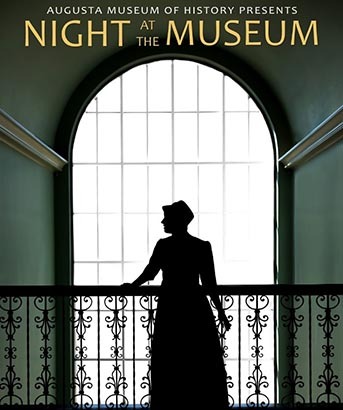 Come experience an evening of mystery and wonder at Augusta's very own Night at the Museum, where history comes to life! After having light hors d'oeuvres and drinks in the Rotunda, guests will be guided through the darkened museum to encounter 10 historical figures from the Augusta region and listen to their stories from the past. The ticket includes performances and a commemorative Night at the Museum glass. There will be two time slots offered. Performances begin promptly at 6:00 pm and 7:30 pm. Doors open 30 minutes prior to show time. Specially priced tickets are available for children aged 6-13 and Military (Classic Cabaret only). Military discount tickets are only available for purchase at the Museum with valid ID. Tickets available online through Eventbrite! Don't want to pay the Eventbrite fee? You can also purchase tickets over the phone 706-722-8454 or at the museum, Monday - Saturday from 10am - 5pm and Sunday from 1pm - 5pm!